Have you ever wondered what the heck to do with the butternut squash that's been sitting on the counter all week? I always find myself looking up recipes for it, but have never fallen in love with one. 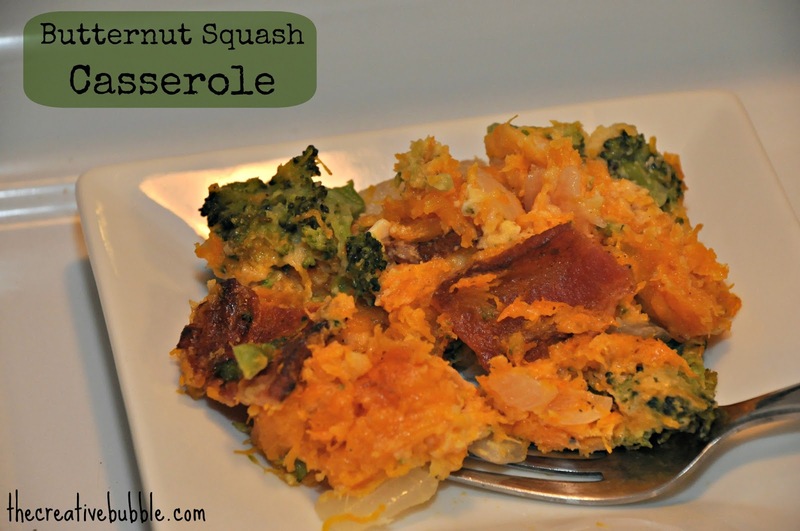 Tonight, I made a casserole using butternut squash, onions, broccoli, and bacon. I was literally licking the serving spoon and dish clean! I would say this recipe should be able to feed four people as a side item, but I'm not too sure about that. It's so good that it only took my one year old son, my husband, and myself to finish it off. Levi even ate his broccoli, no questions asked! Woohoo! In all actuality, it should feed a family of four as a side. There probably won't be any leftovers, mind you. -Preheat oven to 400°. Slice the butternut squash in half length-wise and scrape out the seeds. Roast in the oven face down for 40-45 minutes. -Peel the skin off of the squash once it's cool enough to handle. Slice into cubes and place them into a medium sized casserole dish, then set it aside. A 9x9 would be perfect, but slightly smaller or larger will work as well. -Set the oven temperature to 350°. -Place the broccoli, minced garlic, onion, and butter/oil in a saute pan on med-high heat. Cook until the onions are semi-translucent. Add to the casserole dish with the squash. -Add the chopped, cooked bacon to the casserole dish as well. -In a small bowl, whisk the egg. Then, stir the heavy cream, salt, and pepper into the same bowl. Add this mixture to the casserole dish. -Grate the Parmesan cheese over the casserole, then stir to combine all of the ingredients. You may want to save some of the cheese to add to the top of the dish as well. -Bake at 350° for 15-20 minutes. I hope that you enjoy this dish as much as we did. I welcome your comments, and would love to hear if you try this! Thanks for reading.